The name that we’ve chosen is a little unusual and we commonly find ourselves having to explain it. The good ship Twoflower is named for a character from the Discworld series of books by Terry Pratchett. Twoflower is the first ever tourist in that fictional fantasy world. He is curious, eager for adventure, confident in the good nature of people and not afraid of a little danger, to the exasperation of locals who try to keep him safe. He may be a little naïve and throw himself into situations he doesn’t fully understand, but his faith in the innate good in people, his ability to stay calm and make the best of every situation leads to him making it through safe and sound. 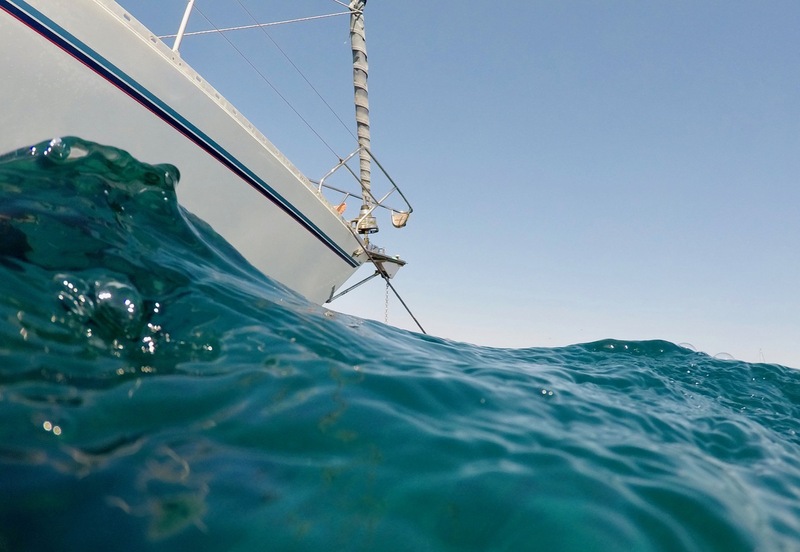 This seemed very fitting for us as we dive headfirst into the world of cruising. Plus the name has a nice sound to it, and I think we’ll be able to handle being called the Twoflowers. As I mentioned earlier, we also wanted the name to fit to our boat. This was a little difficult given that we hadn’t got to spend much time on her yet. However, after we had already changed the name, we discovered a little clue on the boat that suggests that this is a name that will suit her. Above the chart table, by the VHF radio, the previous owners had placed a sticker with the boat’s call sign: 2FOL4. It could hardly be more similar if we had tried! 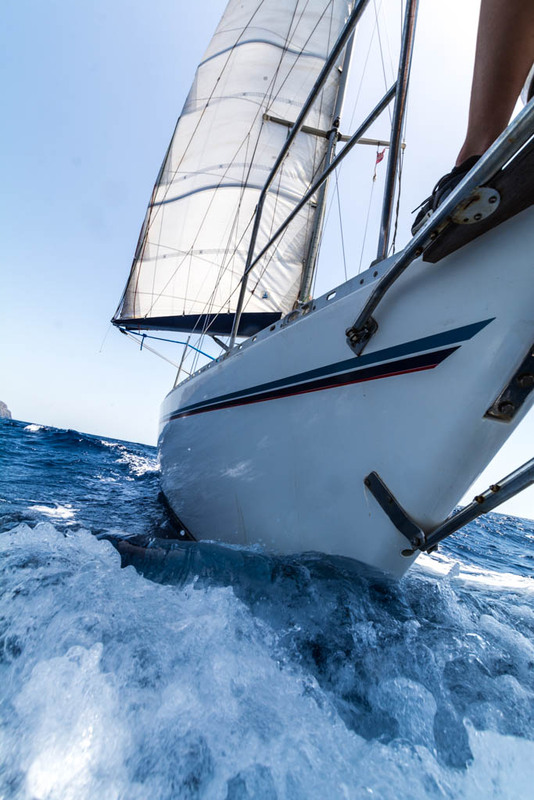 Some sailors are very superstitious about changing the name of a ship. In contrast, the name of our boat seemed to have changed with ever owner so far, and we weren’t about to change that. When a name is to be changed, it is important for it to be marked with a ritual. Here we also made no exception. It was the beginning of August, and we were out with our boat for the second time, this time joined by our friends Andi and Anita from Switzerland. After some slightly uncomfortable sailing and rolly nights at anchor, we were in the marina of Porto Teulada in the south of Sardinia. We had several memorable experiences in the marina: meeting the crew of Rosy Pelican and having a tour of their beautiful Swan yacht; Angie and I discussing the tasks ahead with the boat and making a conscious decision to reduce our plans for the first year so that we could ease our way in and have more fun with it; and, beginning the reincarnation of our boat as Twoflower. As the sun set on the 1st of August, Andi and I removed all the name labels from our boat, leaving her transom plain and empty. The name remained only in one place: Angie and I had written it on a stone that we picked up at the beach that day. The following morning, we headed out of the bay in beautiful sunshine and calm waters. 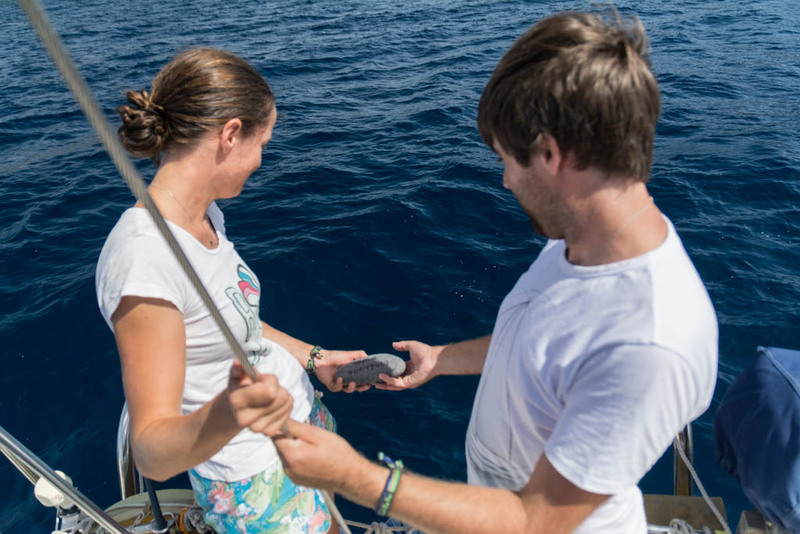 Following the ritual we had learned about from Anita, we put the boat’s engine into reverse gear, and Angie and I threw the name stone from the stern back into the water. The boat reversed over the stone, and turned around out to the open sea as if she wanted to tell us it was time to get going. That day, our boat had no name. 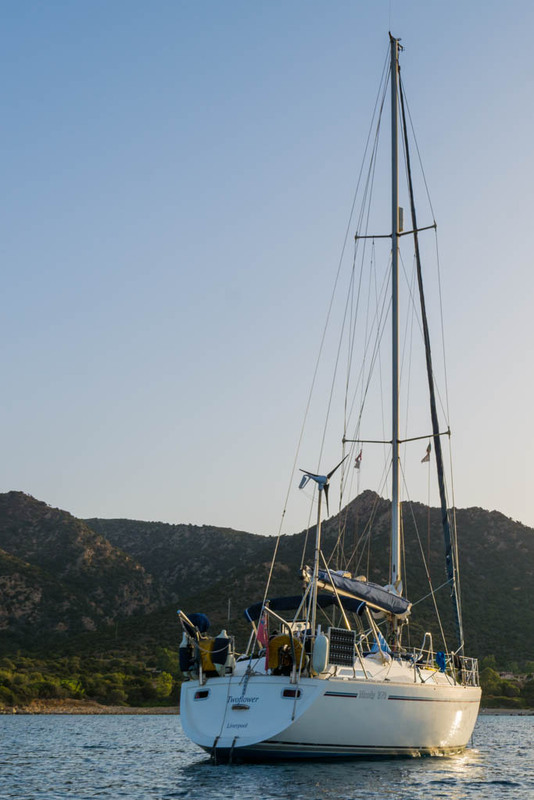 We sailed around Capo Teulada and anchored in pure sand and clear water of the beautiful bay of Porto Pino. We swam across to the beach, admired the massive sand dunes, and our boat rocking gently at anchor. It was time for her to have a name again. 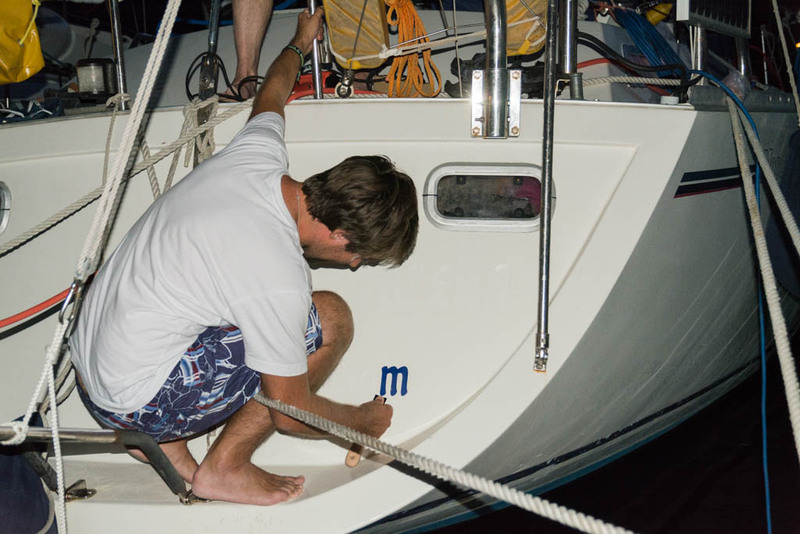 As sunset once more approached, Andi placed the label for our new name on our boat – thanks a lot, Andi! When it was done, he called us over. It was done. The stern now proudly displayed ’Twoflower, Liverpool’. Prosecco fizzed, “An der schönen blauen Donau” was played, Angie and I waltzed down the boat, and we all celebrated. Twoflower was born. Bin schon gespannt was ihr noch alles erlebt und freue mich immer wieder von euch zu lesen.